Zenith is the CEO of Pinnacle Robotics who gives you orders on that island. Into the Breach depicts a conflict between human civilization and giant alien bugs. Dialogue is scant and world building is pretty minimal. The game is primarily interested in throwing puzzles and tactical obstacles your way. But the game’s mechanics often intersect with its characterizations in interesting ways, and I wouldn’t think about Into the Breach in the same way without them. Subset Games’ follow up to FTL: Faster Than Light is a precise, turn-based strategy game in which every little details matters. One false move can quickly spiral into defeat, at which point you can select one of the pilots you’ve been controlling to go back in time and try again. The game has four main corporations—Archive, RST, Pinnacle, and Detritus—each in control of a different island or level of the game. The player interacts with each company’s CEO, but outside of that, not much about these companies and their role in the world is made clear in the narrative. Text mined from the game’s files offer only hints about makeup of this futuristic world. According to Into the Breach’s writer Chris Avellone, best known for his work on Planescape: Torment, there is no canonical lore in the game, only the possibilities and interpretations you can stitch together from snippets of conversations between the game’s pilots. When asked about his favorite piece of dialogue, Avellone was cryptic. “Harold Schmidt and Isaac [Jones] have the most insightful comments about what might be going on in the game,” he said in an email to Kotaku. Isaac’s start-up dialogue is especially dark: “S-s-so many deaths, and I’m b-b-back as if nothing happened... w-w-will there ever be an end to this?” Avellone said he won’t confirm an interpretation of lines like this, but says they’re worth thinking about. The wealth of unreliable narrators and of any fixed plot points make the worldbuilding a fun Rubik’s cube, requiring you to think about not just what pilots say but what their abilities might convey about them. One of the game’s starting, non-generic pilots is Ralph Karlsson. He has his own theories about how the game’s time traveling technology came to be and what its consequences are. “He believes the breach technology was invented and used out of desperation to save a single timeline, and the consequences of what would happen were unknown,” Avellone told Rock, Paper, Shotgun in an interview. “He believes the best way to stop the Vek [Into the Breach’s aliens] is to find a way to return to the original timeline, destroy the Vek at the source, then destroy the breach technology from ever being made.” Other characters believe differently. None of them, or us, will probably ever know whether Karlsson is right. The character’s special ability grants him double XP. Once you max out his level, which happens quickly, there’s basically no reason to use him anymore. In effect, the game encourages you to sideline one of its most experienced pilots within a few runs. “[The] intention behind the trait is that Ralph’s a vet who’s crumbled psyche-wise, so some of his fighting skills have atrophied,” Avellone said. “However, once he gets back into the fight (under your command), he slips back into his old fighting skills faster than the other pilots.” He added that players’ propensity to stop using the character early on is another possible explanation for why his skills began atrophying in the first place. Then there are characters who adhere to certain dualities. Bethany and Isaac, for example, are a sister and brother duo who, prior to the breaches, never coexisted in the same timeline; one of them was always dead. Bethany is an optimist, caring for others and always holding out for the best, traits which are reflected in her protective shield power. Isaac, on the other hand, is an anxious mess of nerves always expecting the worst. Tellingly, his ability is to reverse time for two turns per battle. “Both have had a number of events that have put them to the test, but it’s no one event (or series of events) that caused them to have the outlook they did – it’s simply their nature,” said Avellone. “You can choose to go through life seeing everything half-full or half-empty, it’s a matter of perspective and your choice with how to act when confronted with what life throws at you.” Hence why Isaac, always the worrier, posits in one of his few pieces of dialogue that the entire struggle against the Vek might be useless. “What if we are perpetuating this war by starting new timelines every time we breach?” he asks. But my favorite pilot of all, the one who I can never bring myself to sacrifice, is Prospero, a recycler robot (read: garbage pickup) from Detritus. In effect he cultivates the island’s land. Prospero allegedly started fighting the Vek for no other reason than his programming required it since they were a threat to his gardens. All by himself, he fought off the first wave of bugs and fertilized his gardens with their bodies. Still, he’s a robot, so most humans don’t trust him, nor he them. There are other AIs you get to control in the game, including one called Gana, who, similar to Prospero, was once just used for manual labor but has since been enlisted to fight the Vek. He also has one of the best powers, Preemptive Strike, which lets you deploy him anywhere on the map and damage enemies at the start of a round in the process. Like other robots, he’s also treated with suspicion and held at a distance by human allies. I’ve killed hundreds of bugs and failed to save dozens of timelines in Into the Breach, but still I keep trying because the game’s masterfully crafted ambient story has led me to feel invested in its economical characters. By hinting at their lives outside the game’s combat, it gives me something to help them fight for beyond survival, which is part of what helps Into the Breach feel like more than just an elaborate remix of Tetris or chess. Part of me wants to help Prospero, all Prosperos in fact, to finally save humanity once and for all and be able to return to their gardens like they’ve always wanted. 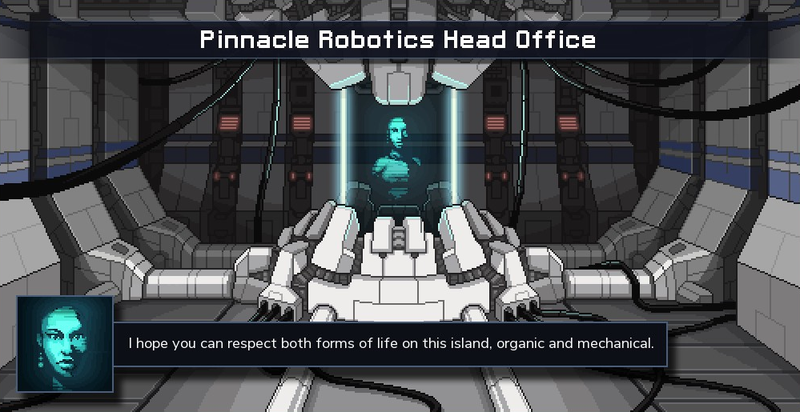 Into the Breach is full of interesting plot possibilities when it comes to time travel and universe jumping, and where exactly, from a sci-fi point of view, the two meet, but at the end of the day it’s the game’s unique characters who have kept me invested in the outcomes.